For the Herald and Torch. Camp near Ellis Ford on the Rappahannock River, Va,. September 14, 1863. 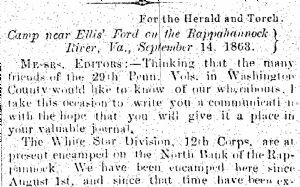 The White Star Division, 12th Corps, are at present encamped on the North Bank of the Rappahannock. We have been encamped here since August 1st, and since that time have been expecting to move every day, but here we are yet ready and waiting whenever called on. As the weather gets cooler the chances of a move are more likely, but in what direction I am not able to say. A cavalry force crossed; the river today on a reconnaissance. They engaged the enemy but the result I did not learn. Three deserters belonging to the 78th N. Y. Vols. were tried and sentenced in be shot in the presence of the Division, on Friday, Sept. 18.— The authorities are determined to put a stop to that greatest of evils in an army : Desertion. We learned, not long since, of the death of our esteemed friend Wm. H. T. Williamson, of your town. His many friends in the 29th were pained to learn that he had taken his departure from this life. Mr. Williamson had many good qualities which endeared him to all his acquaintances, among which was his devotion to the cause of our country. His parents, too, are well known to many members of our Regiment, for their many kindnesses to us during our stay in Hagerstown — and the name of their beloved son will always be held in grateful remembrance by his numerous friends in the 29th Penn, Vols.